School students may soon have to buckle up after seatbelts are installed on school buses. 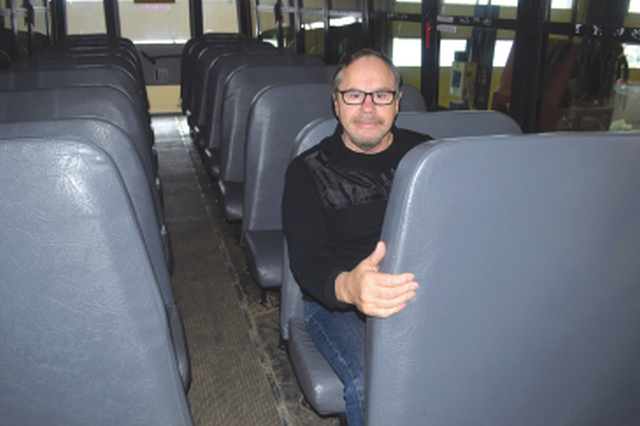 That safety measure is supported by Harry Davis, director of transportation for High Prairie School Division, who sits in a passenger seat on one of the division’s buses. Local students riding school buses may have to buckle up in seatbelts in a year or so. That concept is supported by Harry Davis, director of transportation for the High Prairie School Division. “If Transport Canada says seatbelts are the safest way for student safety on buses, High Prairie School Division would comply,” Davis says. He welcomes news that the federal government will examine the issue. Transport Minister Marc Garneau announced Jan. 21 that he will create a task force to study seatbelts on school buses. News reports state that seatbelts could be installed on newly built school buses starting in 2020. Transport Canada stated for the first time on its website in a posting Dec. 21 that seatbelts, when worn properly, “offer added protection for school-age children”. “Recent acknowledgement by Transport Canada on the safety benefits of seatbelts in school buses is refreshing,” Davis says. Transport Canada is responsible for setting school bus safety standards and conduct safety tests to make certain school buses continue to be the safest mode of transportation for children. Davis has been a member of the Canadian Standards Association technical committee for new school buses for more than 10 years. “While the concept to install seatbelts is strongly supported, there are logistical concerns that the government and the assigned task force need to resolve before implementing,” Davis says. He questions the cost and logistics to retrofit current school buses with seatbelts. “Current buses are not designed to add seatbelts and to withstand the force applied when a passenger is in the seat,” Davis says. High padding on the seats is designed to protect students. That would also add about $15,000 to the cost of a 70-passenger bus that now costs about $120,000, he says. But he says school divisions can’t be expected to pay the full cost if and when seatbelts on school buses will be required. “We will strongly advocate funding support by the provincial government,” Davis says. “That funding support would be critical for school districts to be in compliance,” Davis says. Recent television news documentaries and newspaper stories in Canada and the United States have raised the issue and demand to install seatbelts on school buses.